Well, it was a big weekend at MIDD for us. Not only was it our new President's Inauguration, but we were hosting both Purples Schools (Amherst on Friday night, and Williams on Saturday afternoon), and we were celebrating our MCVB Family Weekend. 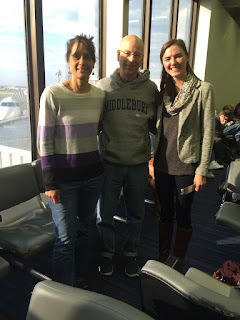 So, to get the party started, Meg texted me a picture of her at the Burlington Airport with Hannah's parents. 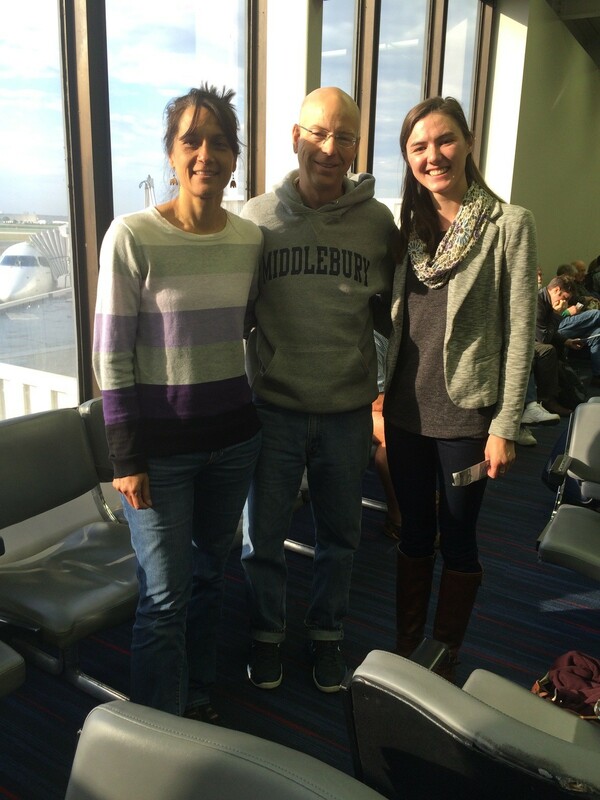 Meg was just getting back from two weeks of Admissions travel, and ran into Andy and Boyd flying in for parents' weekend! Then, the real action began. On Friday night, we started out well, and played back and forth with Amherst for the beginning of the first set until we blew open a 10 point lead to go up 18-8, and 22-14 before they made a late run to close the gap to 23-19. A kill by Hannah and one by Becca closed out the first set win at 25-20. The second set was again very close, but this time, it was back and forth the whole time, featuring 11 ties right up to 19-19, but we seemed to be playing catch up more this time, as we'd fall behind by a couple points, and then come back. We had our last lead at 19-18, before they went on a final run to set point at 19-24 and we finished out dropping the second set 21-25. We knew going in that these NESCAC matches would be decided by a very narrow margin, so we were up for the battle. The third set saw us build up a lead relatively early, going up 12-7, and 18-12. Again both teams had their runs, but we wouldn't give up much ground as even with their runs closing the gap to within four points, they never got closer than that and we finished it out at 25-17. The fourth set saw us go up again early for a 6-1 lead out of the gates, but as had become the mainstay, Amherst came on with a run of their own to tie the game at 12-12. They were playing catch-up this time as we'd go up by a few points, and then they'd come back. We even got to three match points at 24-21 before they made another last push and tied the game. We traded points before a kill by each of our OH's put the match in the books as a W when Isabel got a kill, followed by Becca's kill for the game winner! Our hitting % for the game was .259, and we had three people with double digit digs: Emily with 23, Charlotte with 18, and Becca with 15. Mel again led all players with 6 block assists. Hannah had a match high 5 service aces to go with her 5 kills, and 3 block assists for a very well rounded game, as did Becca with a double-double of 20 kills and 15 digs. There were many great moments, really, but a couple of highlights were Hannah's overpass kill with authority, and Isabel's hitting %. Isabel hit a team high of .432 with 19 kills and only 3 errors on 37 swings. After Becca's 20 kills and Isabel's 19, Eliana came through with the next most kills at 8 with a .263 hitting %. Amherst had been the #2 ranked team in the New England Region coming into the weekend, and we knew we matched up well with them, but we hadn't really been tested, so it was really good to see how we could play with a well-respected and highly ranked team. The next afternoon we took on Williams at 2pm. We got off to a pretty slow start for whatever reason. It was back and forth early on as we were tied at 10-10, but then Williams opened up a lead of 13-19 and it looked somewhat grim. We fought back in it, however, and clawed back to 18-21, and 21-23 before dropping the last two points on a Williams kill and an error by us to lose that first set. The second set saw us get behind early, and once again claw our way back, but 18-23 was as close as we would get and we dropped that set 18-25 and now faced being down 0-2 in sets. We made some personnel changes, and kept fighting back, and got out to a 14-8 and 18-12 lead before a late run by Williams eventually tied the game at 20-20. From that point on, we literally traded points being tied at every point until at 25-25, although we had gone up set point every single time. Finally, a kill by Alice, followed by a kill by Isabel gave us the set win, and kept us in the game! The fourth set was all us, as we got out to a lead pretty early, and hung on to it this time to take the fourth set 25-18, and we forced a deciding 5th set! The fifth set saw us start out slowly, and get behind early by a few points, but again we fought back to tie it at 10. Three quick kills by them forced us to call a timeout, followed by two kills by Becca to bring us within one point at 12-13, but it wasn't enough to put us over the top, and we lost 12-15. It was a very hard fought match, with many ties and many runs by both sides. I was very proud of the team for the way that we fought back after being down two sets, and we just kept fighting. We showed poise not only in fighting back into it, but also getting a lead in that third set, and then blowing it, yet still showing enough composure to close out the win and extend the match. Overall, our hitting % was .248, and we had 7 more kills than they did for the match, but we had more errors in every category except Receiving Errors, and we tied them with 8 service errors. Otherwise, we had more hitting errors, more blocking errors, and more ball handling errors. I think the main takeaway for us was that we can definitely play with anyone, and if and when we see them again, we'll be that much more prepared for their pace of play. After the match, the team and all the families went to Flatbread to celebrate our Family Weekend, and it was a great event. Thank you to Melanie's mom for organizing, and to all the parents for making the trek out here from all over the country! Almost everyone had at least one parent, and everyone adopted Rose, whose father had just been out the week before to watch us play down in CT. When the NESCAC weekly report came out, we were well positioned in almost every category, so we're really working on keeping strong with our fundamentals and keep moving forward with our goals. We're sitting atop the league in Hitting % & Kills, and third in Assists, Blocks, and Service Aces. Individually, Melanie is the league leader in blocks, and 2nd in hitting %. Hannah is second in Assists and 5th in service aces, and both Becca and Isabel are in the top 10 in Kills with Becca 2nd, and Isabel 8th. Gabi rounds out the individual honors by placing 10th in the league in Hitting %, so congrats to all for posting those stats. We try not to place too much emphasis on stats, but they can definitely be a useful tool for evaluation, and affirmation at times, so it's nice to see people recognized for their statistical contributions. We all recognize, however, that it's ALL ABOUT THE TEAM, and while it's nice to get the individual recognition, it's really the team stats that we're focusing on, so it's great to see MIDD near the top in several categories. Now, we're on to preparing for Colby and Bates, and our trek over to Maine. It doesn't even seem all that bad since it took us almost 8 hours to get to Hamilton, and 6 to get to Trinity, so the trip which should take about 6+ hours, we're leaving almost 7 to get there, so hopefully we won't run into any travel troubles this time!